What would compel two Leduc business owners to leave their professional duties for one day to rappel down 29 stories of a downtown high-by rise on a cool summer morning? 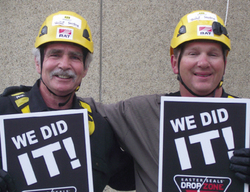 Deciding that the Easter Seals Campaign was a worthy cause and, Ralph Wiesner, owner of Fireplaces by Leduc Chimney Sweep, and his brother-in-law Hans Deweerd, owner of Cabana Pet Resort, raised $3,000 to participate in the Drop Zone –a rappel day for Easter Seals – whose motto is “EMPOWERING people with disabilities”. On Wednesday, August 28, participants who met the fitness and fundraising criteria ($1,500 minimum) joined radio and TV personalities from CBC, who of course helped boost the campaign’s exposure. Spectators were welcome, and they were delighted to see that some participants were costumed as their favorite Superheroes – a subtle indication that they are, in fact, heralded as Easter Seals Heroes. The Easter Seals is a national organization that helps children and adults with disabilities to meet the costs of essential equipment and services. As children grow and their disability progresses, their support equipment needs to be upgraded or replaced; these overwhelming costs, sometimes reaching $10,000 to $40,000 a year place a heavy burden of stress on the families. Each year, thousands of families are helped by generous individuals and corporate donors through Easter Seals- Alberta. Hans Deweerd and his wife Charlene, foster parents for many years, know firsthand the challenging disabilities that can affect the development and life of a youth. Prior to the Drop Zone, the rappelling event at the Sutton Place Hotel in Edmonton on Thursday, August 28, participants attended a mandatory training session at Vertically Inclined Rock Gym. Following the rappel day, a banquet was held at the Sutton Hotel: MC’d by the vivacious and big-hearted Bridget Ryan, it introduced the Easter Seals 2014 Northern Alberta Ambassador Portia Dugan. As used mobility equipment can be donated such as van lifts, power wheelchairs and power scooters, this campaign has raised awareness and donations are still accepted until October at www.easterseals.ab.ca. Innisfail-Sylvan Lake MLA Kerry Towle, also the Wild Rose critic for Human Services, Seniors and the Solicitor General, was among the rappelers: she is well aware of the many challenges facing people with disabilities and believes the Easter Seals Drop Zone rappel experience was a “fantastic challenge, safe and…terrifying!” In memory of her brother who passed away at 35 after a brave battle with Huntington Disease, MLA Towle appreciates the increased awareness the Drop Zone has brought to the Easter Seals’ mission to alleviate the many fears faced by people with disabilities, and their need in securing mobility aids and agency services. To date, this Northern Alberta Rappel Day has raised $120,547. Well done, “Leduc Sweepers” Ralph Wiesner and Hans Deweerd! Along with Alberta MLA Kerry Towle and many other brave supporters, your kind heart and adventurous nature has served the Easter Seals well. The Pipestone Flyer wishes to thank Karen Wiesner for submitting photos and valuable details to this reporter.